Peter Hain was one of the faces, one might say the most notorious face, of the campaign to stop apartheid South Africa’s cricket and rugby teams from touring Britain and Australia and then of the campaign to boycott South African sport globally. For this he was a hate figure for many in the cricket and rugby establishments in Britain as well as South Africa – he was viciously attacked in right-wing newspapers like the Daily Mail and was on the receiving end of hate mail, death threats and attempts to frame him for crimes to end his role in the campaigns and discredit them. He writes how the blinkered right-wing editor of the Daily Mail, Sir John Junor, said that “It would be a mercy for humanity if this unpleasant little creep were to be dropped into a sewerage tank. Up to his ankles. Head first.” (p,42). This was typical of how the conservative, pro-apartheid press treated those who sought to oppose apartheid and the application of racism to sport. 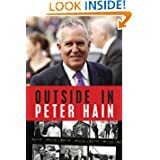 In this review, I will stick to South Africa, though in his autobiographical account Hain deals fascinatingly, though from his own viewpoint (rather than dispassionately) with his political career in the Young Liberals and then the Labour Party,becoming a cabinet minister under Blair and Brown. His depiction of Brown as “well-intentioned, superhumanely dedicated and decent, by dysfuncional” is the most acute observation of the former Prime Minister I’ve read. His account of growing up in apartheid South Africa in a family fighting racism and willing to put themselves in the firing line is fascinating. What is most chilling, and this reminds my of all that I read about many ordinary Germans in Nazi Germany when I was writing a book chapter on German propaganda, is the way that decent, intelligent and otherwise reasonable white South Africans accepted apartheid with all its evils and violence because they could somehow distance themselves and say it was someone else’s idea while demanding racial loyalty from all whites.. Hain talks of how family members could not accept the way that his parents fought on behalf of the black majority and stood out against, as they saw it, white interests and survival. He wrotes of his family’s forced move to Britain and then his own development into an activist. His main field – before being active in the anti-racist Anti-Nazi League – was in opposing and organizing boycotts of South African sports tours to try to highlight the racism inherent in South African sport and to oppose apartheid itself. There has been much discussion of this campaign and whether it merely punished South African sportsmen without affecting the longevity of apartheid or whether it helped bring down apartheid. I would side with Hain and fully support his actions and his reasoning for doing it. This is not just because I was active in the Anti-Apartheid Movement in the 1980s and wrote for its newspaper, but because on trips as a BBC journalist to South Africa between 1990 and 1995 I spoke to politicians and sportsmen from the white community, visited rugby clubs and saw the near desperation of the white, sports-mad community to be part of world sport. Under apartheid, especially after the mid-80s, white South Africans felt isolated and knew in their hearts that apartheid was responsible. I remember sitting in the office of Renier Schoeman, a leading figure in the National Party, in March 1990 and seeing framed on his wall the certificate you got when to subscribed to National Geographic. It was up on his wall along with pictures of him in office and other important reflections of his public lfe. That was how much white South Africans wanted to be part of the wider world. The sports boycott had its effect. Their acceptance back into the sporting world after 1994 and the reaction among white South Africans to Rugby World Cup victory and Nelson man dela’s presence at the final showed that. This is a fascinating and personal account by Hain of the campaigns and of the way that the British sporting and conservative establishment (including a series of right-wing judges) tried to stop him. It adds to the growing literature from the inside of the fight within and without to end apartheid. This entry was posted in Southern Africa and tagged boycotting apartheid sport, Peter Hain, South African sports boycott. Bookmark the permalink.